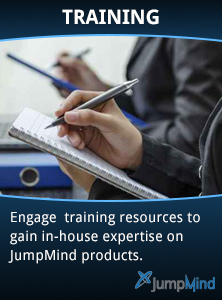 Engage our experienced training instructors to gain in-depth knowledge and expertise on JumpMind products. We offer courses on both SymmetricDS and Metl, delivered by our instructors in one of our classrooms or at your work location. Course material can be customized to meet your specific needs, if desired. Our hands-on training courses are offered here in Columbus, Ohio, and are lead by an instructor in a classroom setting, usually with small groups of 10 or fewer people. Our instructors are product experts with extensive experience using and implementing the product. Each participant is given a book and media of the course material that can be kept as a reference. The lessons are designed to introduce new concepts through lecture and demonstration followed by hands-on exercises to practice and apply the knowledge. We bring our experienced instructor and training material directly to you at your site. Onsite training is a good option when a team of four or more need to be trained at once. The course can also be customized to fit the scenarios your team faces and you benefit from individualized attention. Online training is the same course led by a live instructor using conferencing and screen sharing tools such as Skype. Participants receive course materials ahead of time and as a PDF file. This option works best with intermediate and advanced topics where participants need interaction from the instructor but with less attention to walking through individual problems.